Deputy Prime Minister Nguyen Xuan Phuc has emphasised the need to improve ethnic policies as critically important to ensuring equality between different ethnic groups and promoting development in ethnic minority regions. Attending a conference held by the Committee for Ethnic Affairs (CEA) in Lao Cai Province on February 27, the deputy PM said many current policies were overlapping and inappropriate, while there was a lack of coordination between relevant agencies. He noted that the wealth gap between ethnic minority groups and other regions was widening, which could eventually lead to conflict, something that should receive more attention from the central government. Deputy PM Phuc requested relevant ministries and agencies enhance their sense of responsibility, and review and propose changes to existing ethnic policies in order to make them more workable. According to CAE Chairman Giang Seo Phu, an estimated VND135.8 trillion (US$6.1 billion) from the government budget has been allocated for implementation of ethnic policies over the past five years, making up 12.8% of budget for rural development programmes. He said despite positive results, infrastructure in ethnic and mountainous regions remained dilapidated, and the rate of poverty high with many communes reporting to have more than half of the population living below the poverty line. 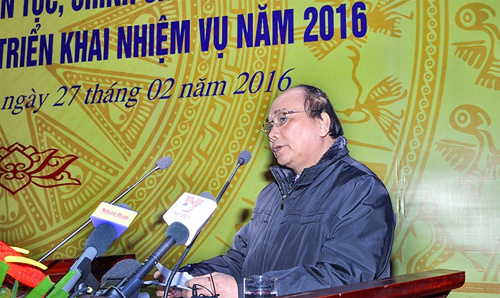 Minister of Agriculture and Rural Development Cao Duc Phat said agricultural production in ethnic and mountainous areas was unstable due to heavy reliance on weather conditions, which is exacerbated by climate change. He stated that if there was no linkage between enterprises and farmers and between farmers themselves, it would be difficult to foster large-scale agricultural production and the application of science and technology./.